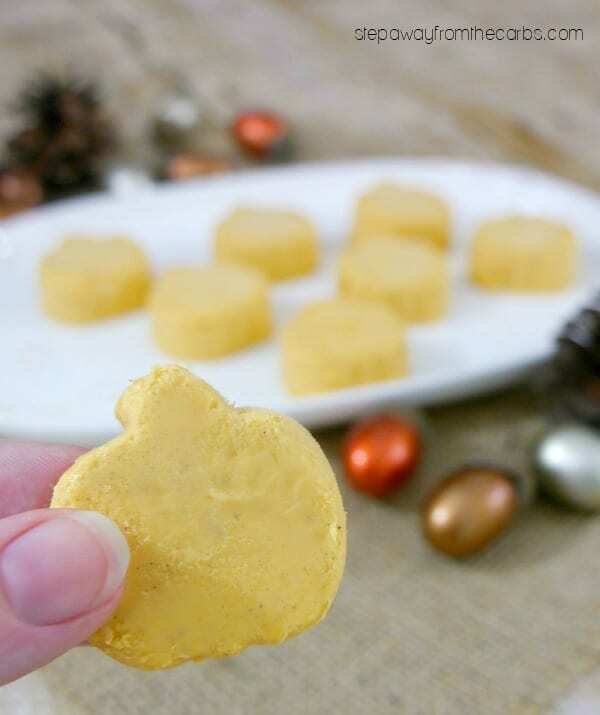 These pumpkin fat bombs are great for a sweet treat or snack! 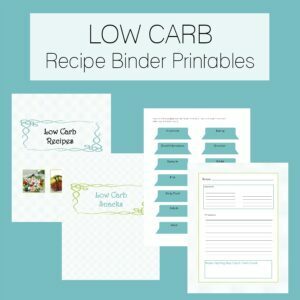 Low carb, keto, LCHF, and sugar free recipe. If you love the flavor of pumpkin pie spice, then you just have to try these fat bombs! The smooth and creamy pumpkin mixture can be made really quickly – the hardest part is waiting for them to harden up in the freezer without having a sneaky sample! 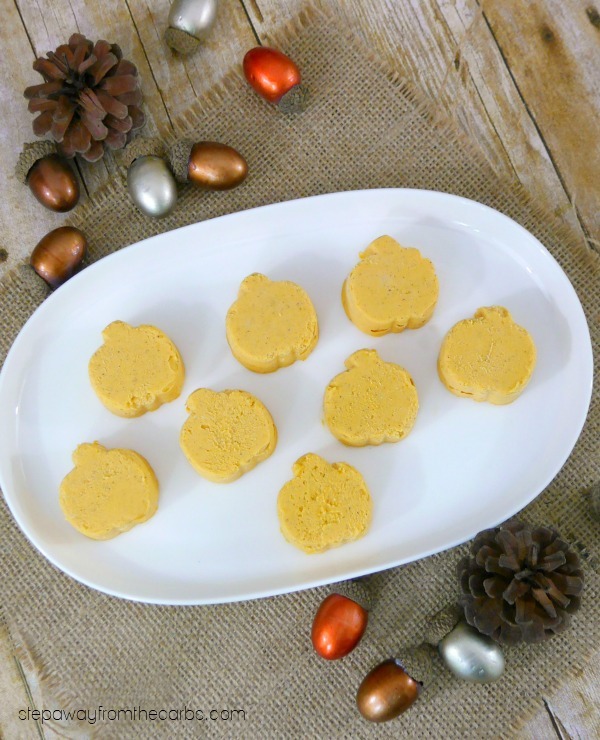 To make these pumpkin bombs, mix together softened cream cheese, softened unsalted butter, low carb sweetener (eg xylitol or Swerve), pumpkin puree (100% pumpkin – not pie filling! 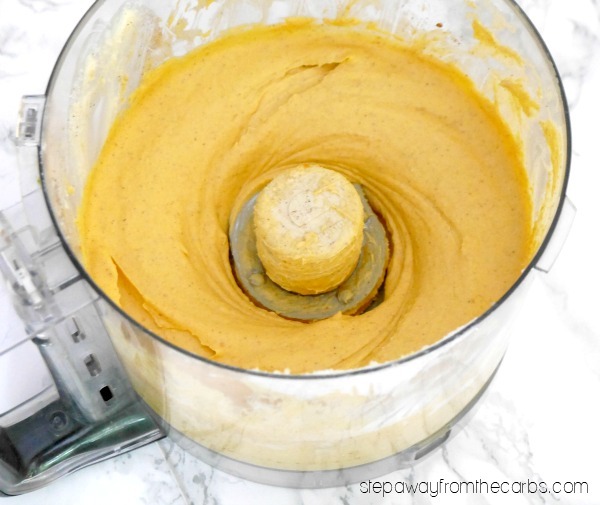 ), and pumpkin pie spice in a food processor. Blend until smooth. At this point you could just dollop spoonfuls of the mixture onto a baking sheet lined with a silicone mat or wax paper – or you could spoon it into a piping bag for some fancy shapes. However, I used a silicone pumpkin mold ( I don’t see it on Amazon right now but very similar to this mold). It has 24 cavities and when I first spooned the mixture in it only filled 22 – but by using a flat spatula to smooth over the tops of each fat bomb, I had enough excess to fill the other two! Oh, and tap the silicone mold on a flat surface a few times too – this will remove any air bubbles. Place the mold (or baking sheet, if using that method) into the freezer for at least 3 hours. 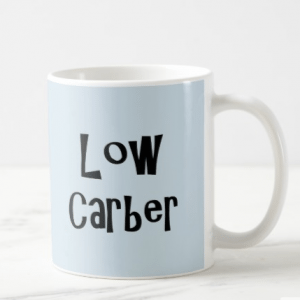 After that time, remove the fat bombs from the mold, place in a bag or box, and store in the freezer until the mood strikes you for a yummy low carb snack! 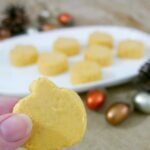 I hope you enjoy these yummy pumpkin fat bombs this fall! 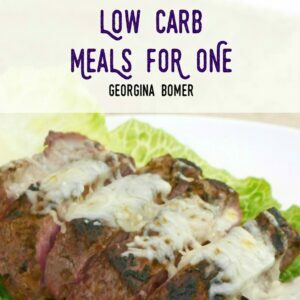 Mix all the ingredients together in a food processor. Blend until smooth. 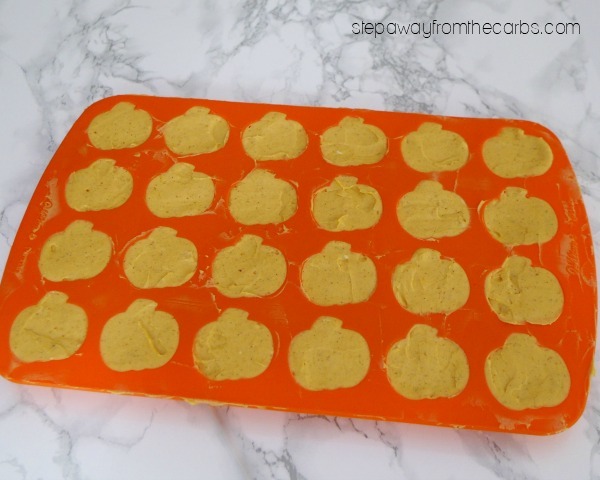 Dollop spoonfuls of the mixture onto a baking sheet lined with a silicone mat or wax paper, spoon it into a piping bag and make fancy shapes, or spoon the mixture into a 24-cavity silicone pumpkin mold. If using a silicone mold, tap it on a flat surface a few times to remove any air bubbles, and use a flat spatula to remove any excess. Place the mold (or baking sheet, if using that method) into the freezer for at least 3 hours. 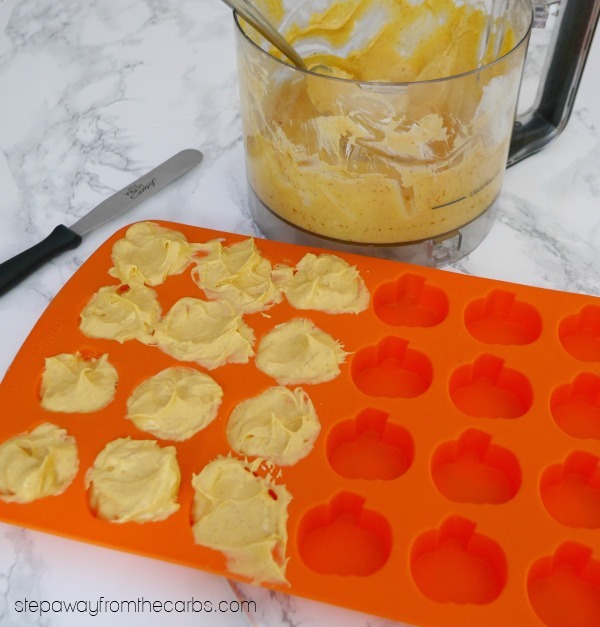 After that time, remove the fat bombs from the mold, place in a bag or box, and store in the freezer.